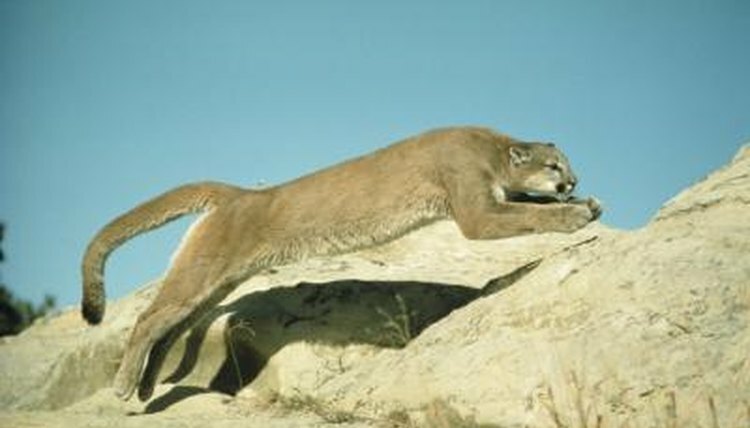 The puma is a stealthy creature who hunts primarily at dawn and dusk, sneaking around to get the jump on unsuspecting prey. That doesn't mean he can't keep up with a target in motion, though. At a sprint, this animal can reach a top speed of about 50 miles per hour. He can maintain a speed of 10 miles per hour for several miles, so he has stamina as well as the ability to run in fast bursts. When he gets close enough to his prey, his powerful legs help him close the gap with a leap -- he can jump a flat distance of up to 40 feet while running or 18 feet up into a tree.